Generally, the classic mint julep needs no tweaking, but we have to admit that this peach infused one is a nice departure. It’s full of flavor and a perfect segway into spring. If you have a favorite bourbon (don’t we all? ), be sure to grab a bottle or two, depending on how generous you’re feeling. But, like all well-crafted cocktails, this Bourbon Peach Julep Fizz is to be sipped and enjoyed, not slugged back like a can of beer. This recipe is simple, as are the flavors that round out the sinful, sugary fizz. Make peach simple syrup by placing the sugar and water in a pot over low heat with half of the peach, sliced. Stir. After the sugar has melted, set aside to cool and remove the peach slices. 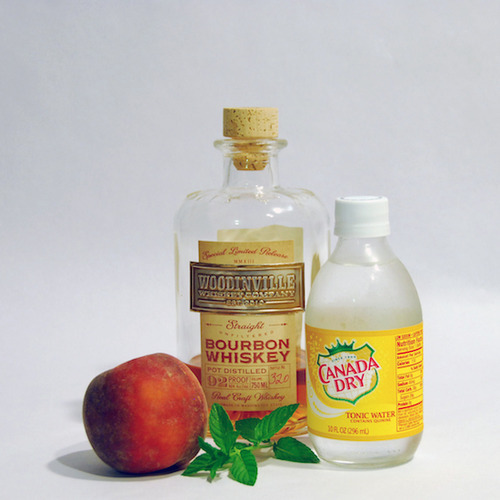 Combine the bourbon, peach simple syrup, and tonic water in a lowball glass with ice and stir. Garnish with a few fresh peach slices and a mint sprig.